Design Franc Art specializes in manufacturing parts in acrylic, PVC, ABS, and polycarbonate, as well as non-ferrous metals including brass, copper, and aluminum. 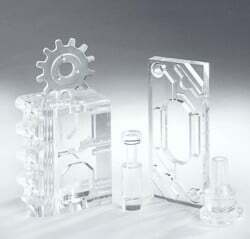 Whether it is for medical, industrial, electronic, or scientific applications, or others, whether it is a single prototype, hundreds or thousands of units, our team is eager to help you throughout the production process of your product. Design Franc Art is equipped with digital lathes, CNC 3-axis and 5-axis milling machines, C02 lasers, and water jet cutters that can meet the requirements of any simple or complex project.